Pinkie Pie is aware of that annoying logo, but Twilight isn't. Rat: Oh, I'm sorry; you're in the middle of some over-hyped, overly complex storyline and couldn't possibly acknowledge the fact that this is a comic! If you have a character who has Medium Awareness or is capable of Breaking the Fourth Wall, it's quite common to observe his interactions with characters who don't know they're fictional. Any time our medium-aware friend will directly address the audience or mention some boundaries of the medium, everybody else will either ignore him or act surprised and find themselves unable to understand what he's talking about. Eventually the other person will think he either is joking or has a few screws loose. Usually, no matter what he does, his efforts to make them realize they're all fictional characters will be meaningless—nobody will believe or even understand him. Most of the time this trope is played in the same way medium awareness is in said work of fiction. If it's Played for Laughs, so is everybody's ignorance. If medium awareness is Played for Drama, this trope may add a little to it—our hero has to deal with being a fictional character and everybody else thinking he's crazy. Contrast No Fourth Wall and Who Would Want to Watch Us? ; compare Cassandra Truth, The Cuckoolander Was Right and This Is Reality. A UK TV advert for Tesco supermarket shows a woman discussing the special offers with the voice-over, while her family and passers-by look increasingly worried. At the end, her husband checks how full a wine bottle is, while she continues talking to thin air. A 1983 PSA for the US National Wildlife Federation featuring The Muppets has Kermit and Fozzie discussing polution. At the end Kermit turns to the camera and gives the viewers an address to write to for more information. Fozzie asks who he's talking to. In the last episode of FLCL, Kamon explains why manga-like scenes from the first episode didn't appear in later episodes ("It takes time and a lot of work") and why they reappeared in the last one (the creators were "accused of being lazy"). Naota has no idea what Kamon is talking about. In the first episode they have a cut to a commentary track where Haruko mentions it's really hard to do slow motion scenes because you have to hold your breath while you do it. Naota: That was you?! I thought it was a special effect! In the first episode of Haiyore! Nyarko-san W, Nyarko gives introductions for Tamae and Yoichi for anybody who missed the first season; in the next cut, we see Nyarko is facing the front of the classroom and Mahiro asks "Who the heck are you talking to?" Mei Company begins with Mei Sakuragi giving an opening narration explaining how her world works. Her friend Itsuki Mizuta then asks who she is talking to. Played for Laughs in Rosario + Vampire, when the local Fourth-Wall Observer, Kurumu Kurono, complains to the audience that she's been shoved Out of Focus only one episode after she was introduced. This prompts the narrator bat of all people to ask the audience who she's talking to. in Etotama, Ordinary High-School Student Takeru isn't aware in the slightest that he's in an anime, which leaves him all the more confused when the deities around him constantly shatter the fourth wall to pieces. In the Magi: The Labyrinth of Magic prequel series Adventures of Sinbad, we get this after Sinbad, Mystras and Ja'far wind up naked in the wilderness. Ja'far: (pointing from an angle where his hands strategically hide the others' crotches) Listen, why don't you hide those instead? Ja'far: Those things that aren't supposed to be seen on-screen! This happens to Deadpool a lot. Every time he breaks the fourth wall or indicates he knows he's a comic book character in the presence of someone else, they have absolutely no idea what he means. Most commonly the other character will respond with a Flat "What." and an assumption that he's crazy. This being Deadpool, they're probably not that far off. Subverted in Uncanny X-Force #34. After saving Wolverine, Deadpool tells him that he wasn't worried about him dying because apparently "everyone knew he wasn't going to die". When Wolverine asks who are everyone, Deadpool points out to the reader, but in the next panel we find out he was actually pointing to a security camera. It turns into Mind Screw when you start wondering why the guys watching the footage of the security camera would think Wolverine was safe from dying. Played for Laughs in an issue of Damage Control where the characters met She-Hulk, and showed what her Medium Awareness looked like from the outside. One time when She-Hulk guest starred in her cousin's book (or possibly vice versa), at the end she addressed the audience; Hulk (who was intelligent at the time) called her on it. Hulk: Who are you talking to? She-Hulk: The people on the other side of the fourth wall. Hulk: Uh, Jen? There's no wall there. (waves hand to demonstrate) Just air. Played straight in Grant Morrison's run on Animal Man. His arc featured the main character gradually becoming aware that he is a comic character. He once wandered through Comic Limbo where different discarded characters made references to him being a character, only for him to be confused or outright dismiss them. In one issue, several DC characters wiped out during the Crisis on Infinite Earths event reappeared. One character fully realized he was in a comic and pointed at the reader, claiming that "they" are enjoying the suffering of the characters and that the characters will be doomed to repeat these traumatic events every time someone reads that issue. At first, the other characters believe he's insane but they gradually see it too, eventually realizing that he was right. They don't react well. Note that this storyline alternates between being outside canon (and for good reason—imagine the Fridge Logic and Fridge Horror that would affect the DC Universe if it were) and being a mystical experience of The Multiverse that its participants could only interpret by way of a Breaking the Fourth Wall metaphor, though Morrison has dragged Meta Fiction elements into other stories such as Final Crisis. When he guest-stars in the JLApe crossover because the Martian Manhunter needs information about morphic resonance, he's had a bit of a breakdown and his reaction is "Oh god, I'm important to the plot..." J'onn learns Buddy's view of reality via his telepathy, but decides not to share it with anyone. The Joker's been known to do this in any medium he appears in. This most occurs in Batman: The Animated Series. -How iwonic! It could only be a wwiter's idea. -Oh, just an imaginawy figuwe. Also, when robots went back in time to kill Monica, Smudge and Jimmy so their descendants won't exist to revolt against robotkind, one of the robots theorized the one that came up with the idea plagiarized it from some movie. 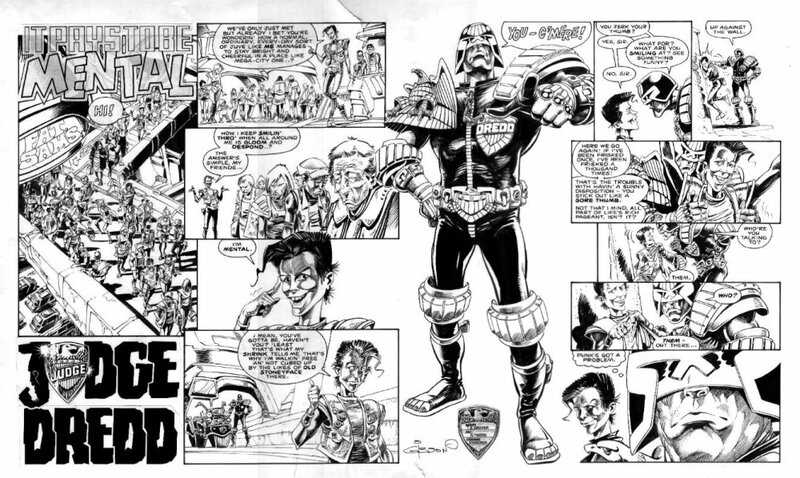 The 2000AD one-shot story It Pays To Be Mental had the main character (a class-D mental patient—quite harmless, released to community care) narrating to the audience. Dredd naturally considers talking to an imaginary audience quite subversive ◊ but can't touch the patient due to his mental license, leading to an Aside Glance on the part of Dredd. In Spider-Verse, the version of Peter Parker from the Ultimate Spider-Man animated series narrates his adventures, just like in the cartoon. His fellow Spider-Men are bewildered by this. Sixties Peter Parker: Who's he talking to? Miles Morales: I'm starting to think even he doesn't know. In Code: Pony Evolution, all the Lyoko Warriors are really confused by Pinkie Pie. Twilight: Remember, DON'T QUESTION IT! In the Doctor Who drabble "Legacy ", the other Time Lords wonder who Rassilon keeps talking to. Sonata Dusk starts breaking the fourth wall and Aria Blaze doesn't know what she's talking about. Megalon and the Mane-iac start breaking the fourth wall and Gigan doesn't know what they are talking about. However, when they point at it, Gigan is briefly able to see the fourth wall and is horrified. Discord starts referencing Toho's website and the fic's own TV Tropes page. Rainbow Dash and Pinkie Pie have no idea what he is talking about. Pinkie Pie often references differences between the fic and the actual show, expresses her hatred of her portrayal in Cupcakes, and other fourth wall shenanigans, which always confuses her friends. Nyarlathotrot suddenly starts ranting and raving at the author and readers, then threatening and insulting them. The heroes have no idea who he is yelling at, though Daring Do, who had been brought to life from her story, has a vague idea. Kid Icarus Uprising: The Novelization: In Chapter 2, after opening the booby-trapped treasure box, Pit tells Magnus that he did it because the author made him do it. Magnus is completely clueless as to what he's talking about. The main character in Woody Allen's Whatever Works does this all the time, to everyone else's bewilderment. Invoked in Wayne's World: "Only me and Garth get to talk to the camera!" Played with in Pirates of the Great Salt Lake at the Narrator is either invisible or unremarkable to the characters. After one character is killed he can suddenly see the narrator, but not the audience the narrator is talking to. Rob: When is this gonna stop?! Laura (who just walked in): When's what gonna stop? The Truman Show has an in-universe example, when Truman sees that his wife is presenting him food as if she was doing advertisement for it  which she's doing, actually. This is the plot of Last Action Hero. The kid from reality has to convince the character that he's inside a movie. Incompetent detective McSorely from Eat And Run is constantly narrating for the benefit of the audience, and on more than one occasion other characters ask who the hell he's talking to. He's not actually aware of the fourth wall, however, he's just crazy. Played for drama in Charlie the Purple Giraffe Was Acting Strangely by David D. Levine. This happens often at 30 Rock. In one of the final episodes, Jenna turns to the camera and admits she's never met Mickey Rourke. Liz looks at where Jenna is looking in confusion. One episode of Just Shoot Me! had Maya meeting an insane man who thought he was Woody Allen. Near the end, he breaks the fourth wall and starts talking to the camera, to Maya's great confusion. In Spamalot, one of the quests King Arthur has been assigned (in addition to finding the Holy Grail) is to put on a Broadway musical. Later on in the show, The Lady of the Lake graciously points out to him that "but you ARE on Broadway!". King Arthur is rather surprised. The Grail then turns out to be under one of the seats in the audience. Common in Super Paper Mario, where exposition dumps and tutorials will often make reference to the player sitting in front of the screen, much to the confusion of Mario and company. This is also done in Paper Mario: The Thousand-Year Door, as there are a couple instances of a character talking to the player, leading your partner to ask what they mean by "you in front of the TV". In Metal Gear Solid 2: Sons of Liberty, Raiden will be utterly confused any time a character breaks the fourth wall. In The Secret of Monkey Island, Herman Toothrot makes a number of snarky aside comments during Act 3. When Guybrush eventually asks "Who are you talking to? ", Herman cheerily replies "The people watching!" In Senran Kagura: Estival Versus, Asuka says to watch the OAV for more information about Ryōna. Homura asks who she is talking to. Asuka convinces her not to worry about it. In Fate/Grand Order, characters who originated from gag mangas like Nobunaga and Sakura Saber often break the fourth wall like in their home series, while the others don't know what they are talking about. The page quote comes from El Goonish Shive where filler strips have No Fourth Wall, but story arcs do. When Matt and Rat, two discarded characters, tried to complain to Tedd about not being protagonists, he didn't know what they meant. Matt quickly deducted that it means a story arc started, so Tedd is no longer aware he that is in a comic. And then he forced him to break the fourth wall so they could have an argument. Said characters were subsequently treated for their shared psychosis and became productive members of society according to Word of God . Every time Mindmistress meets medium-aware characters, she tries to explain why it's impossible for them to be comics characters. It never works. In Crossoverkill, when the Doppleganger Gang confronts the Master Assassin - leader of the Character Assassins, a killer cult that believes they can break the fourth wall and enslave their creator by killing the "Alpha Character" - we can see how his breaking the fourth wall and addressing the reader looks from their perspective. Kid Apocalypse: And what's with the kooky asides? Who's he thinks he is talking to? Amusingly, Master Assassin is not actually fourth-wall aware - he just thinks he is. His aside glances are as likely to go away from the reader as towards them. The sprite comic Kid Radd uses this trope - it's about video game characters being rescued from their games and living in the internet. Sometimes it takes a while for them to adjust. In Drow Tales, the first time Keil talks to the audience, a Guard asks who she's talking to. Inverted later on, when she's talking to Naal, who assumes she's talking to her imaginary friend and walks off. 1/0 has this as a major plot point as characters start developing "personal Fourth Walls". In Bob and George, Megaman is paranoid, and Protoman disbelieving. Antimony: Who are you even talking to? In The Order of the Stick after telling Roy that Belkar will die before the end of the year, the Oracle specifies in an aside to the readers that he means a year in the comic, not real life, much to Roy's confusion. Despite the fact that there's usually No Fourth Wall in the comic. Silas, occasional narrator of Something*Positive. Mostly the other characters try their best to ignore him, but sometimes they feel the need to point out there's nobody there. Davan: Silas, how many times have I told you not to sit on my porch and narrate gossip to your imaginary cowpoke friends? In I'm a Marvel... and I'm a DC, where there is No Fourth Wall, Darkseid does not know he is a fictional character and gets very mad when The Joker tries to tell him what he really is. In one of TomSka video, two friends are arguing over whether they are in a student film? During Half in the Bag, either Mike or Jay will acknowledge the camera, with the other literally asking, "Who are you talking to?" In the Duck Dodgers episode parodying 1970s anime, Marvin the Martian explains his motives in villainous monologue directly to the viewers, and one of his robot minions ask who he's talking to. Marvin tries to explain but fails and the robots spend the rest of the episode laughing at him. The Kim Possible episode "Grand Size Me" ended with Ron addressing the audience about genetic mutation. Nobody knew whom he was addressing and he was sent to the teacher's office. In Turtles Forever, Hun eventually gets fed up with 80s Raphael making asides to the audience, and snaps "Why do you keep doing that? Who are you talking to?! THERE'S NO ONE THERE!" Brandy: Lola, I must have seen that same thing happen in like a dozen TV shows, and it never worked once! Lola: But Brandy, this isn't a TV show! This is real life! Brandy: (Aside Glance) I haven't had the heart to tell her. The page image is from a fan comic for My Little Pony: Friendship Is Magic, where the character Pinkie Pie frequently leans on the fourth wall, with the occasional breaking. Surprisingly enough, this trope does not apply to this character. It does apply to supporting character Iron Will though, who gives the fourth wall a thumbs-up whenever he says one of his catchphrases, to the confusion of other characters, including Pinkie Pie. Sharon: Um, Sheila, who are you talking to? Shiela: You wouldn't understand. It's a Jersey thing. One episode from the very short lived stop-motion Black Comedy Canadian TV series, What It's Like Being Alone, had one of the mutated orphans, Sammy Fishboy, suddenly becomes aware than an unseen audience is watching him and freaks out that they (us) won't leave him alone and the idea that he may cease to exist if the show ends or we change the channel. Whenever he tries to point out to the others where he's being watched, the camera pans to show him pointing at random objects and locations. The other orphans and their caretaker Aldous think he is insane and use different methods to cure his madness, including medications, being catapulted into a nearby tree, shock treatment, and dumping him in a bath filled with hundreds of leeches. Eventually, the resident sea monster patches things up by stating that Sammy's "delusions" are his imagination and that everyone else has one. Sammy Fishboy: Oh my god I can see you! Yeah, yeah, yeah you out there! A-am I still asleep? Why does it feel like I'm trapped in a TV show?! Why have you trapped me here while you watch, you ugly pink fleshy things with your sofas and chairs and ugly pictures on your walls! What's going on here! How did this happen! STOP WATCHING ME YOU UGLY PEOPLE! Why are you out there watching meee! Brian Brain: Who is Sammy conversing with? Jem episode "The Day the Music Died" had the titular character asking who Riot was talking to when he told the audience she was okay. Bugs Bunny makes Gossamer self-conscious when he points out the audience in "Hair-Raising Hare"
This happens frequently on Danger Mouse. Notably when Mac The Spoon asks who "are all these viewers?" Penfold names four. Dexter's Laboratory: When Dexter gets fed up with Dee Dee's antics, he "fires" her and seeks a replacement. He settles on a buxom woman, and after trying to coach her on Dee Dee's mannerisms, she starts complaining that there are no cameras or people watching. Dexter is utterly confused what she's talking about. Buxom woman: This is Dexter's Lab, right? Buxom woman: The TV show? Dexter: TV show? This is not a TV show. I'm a real little boy and this is my lab! I built it. Every episode of Little Bill ends with Little Bill in bed, talking to the audience about his adventures that day. It always ends with a member of the family (varying each time) calling in from the hallway: "Little Bill! Who are you talking to?" The sketch from Robot Chicken where He-Man is accidentally killed has him addressing the audience on how trees are some of our most precious resources; Skeletor then leans into the shot and asks who he's talking to. He-Man responds, "Your face" and punches Skeletor. In the Avengers, Assemble! episode "Avengers Disassembled", Iron Man recruits Spider-Man onto the team. The others question this decision when Spidey is shown standing in the corner talking to himself, apparently expecting the fight to stop until he's finished, like it does in Ultimate Spider-Man. Jonny 2x4 from Ed, Edd n Eddy is the only character in a series where every other character has Medium Awareness to not know about the fourth wall. At the end of Ed, Edd n Eddy's Big Picture Show, Johnny is baffled when Plank tells him they haven't got time to get revenge on the other kids for an earlier slight because the movie is over. Johnny: There's no time left? It's the end of the movie? What movie?! Animaniacs has a scene where the Warners are cornered by Mr Director, and give an Aside Glance to the audience. Mr Director wonders who they were looking at, and even presses his nose right up against the camera lens to see 'the nice people in the teeveeee! ', yet somehow he still doesn't see anybody there. Rick and Morty: Rick is frequently shown as a Fourth-Wall Observer, but these comments are typically ignored or found confusing by other characters. Doesn't help that said comments are often part of Rick's many rambling diatribes. Rick: Wake up, Morty! We're in a promo commercial! This isn't real life! Morty: Promo commercial? What're you talking about?